Meneage Dental are one of the top dentists in Cornwall – established for over 30 years and providing a wide range of treatments. Based in Helston, they have patients from across the county. They can be reached on Telephone Number: 01326 574 006. If you are looking for the best dentists in Cornwall, Meneage Dental are a popular choice because of their skilled team and excellent customer service. We have first-hand experience as clients of the practice, and the atmosphere at the surgery, the friendliness of the staff, and the treatments received are all first class. What makes the practice unique is the calm and relaxed nature of every visit. There’s a spacious reception and waiting room area with a water cooler and a wide range of newspapers and magazines for if you turn up early. You then have an unhurried appointment and for any decisions about a dental treatment, time is taken to discuss the options with you. There’s no hard-sell approach and the emphasis always seems to be on long-term dental health. These dentists in Helston offer a wide range of treatments and have provided superb dental care for over 35 years to patients across Cornwall – and will no doubt continue to do so for many years into the future. Always have extremely friendly service here. I always feel a thorough job done! Helpful and friendly staff. Put you at ease. Modern and clean practice. 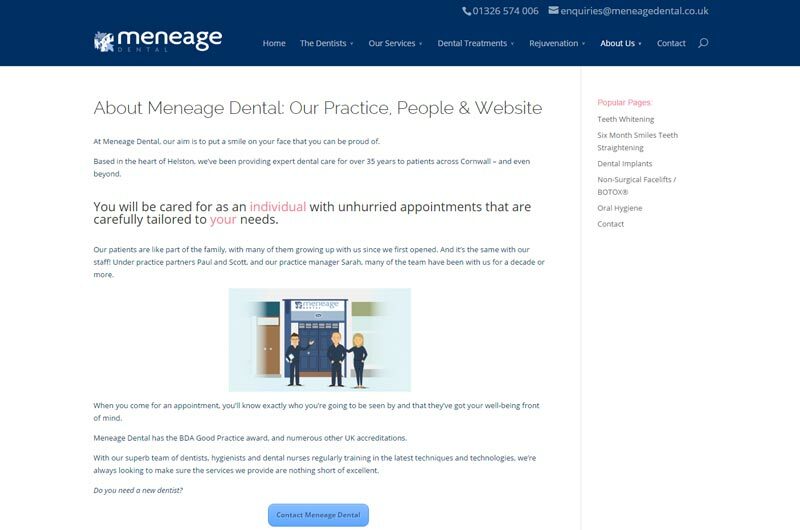 Visit www.meneagedental.co.uk to learn more about their dentists, the treatments and to book an appointment.